Here’s a round-up of some of the tasty titbits I’ve been sent recently and marvellous morsels I’ve discovered for myself. I’m prone to tutting when we’re down our local and my husband buys a bag of pork scratchings. While I might surreptitiously steal one or two, they’re not usually the most pleasant experience – unless munching on deep-fried hunks of grease is your thing. However the pork crackling from Mr Trotter’s is in quite a different league and unlike anything you’d find on offer in your average pub. Mr Trotter’s ‘revolutionary’ British pork snack was the brainchild of food writer Tom Parker Bowles, Great British Menu judge Matthew Fort, and Cotswold farmer Rupert Ponsonby. Unlike most scratchings made from imported Danish rind, it is cooked from 100% British pork, and uses no added MSG. 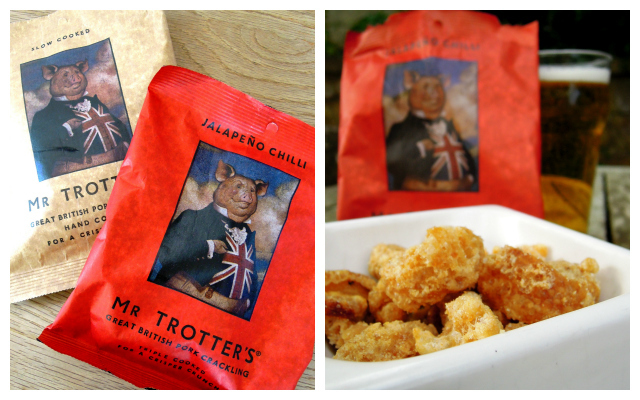 Mr Trotter’s are triple-cooked for a fantastic crunch, and seasoned with natural yeast and sea salt. The Original variety is pretty good, but it’s the Jalapeno Chilli version that really floated my boat and I reckon it’s the perfect accompaniment to a pint of lager. Not too greasy, they’re light and crunchy, and very, very tasty. Not the healthiest snack in the world either but ruddy lovely nonetheless. 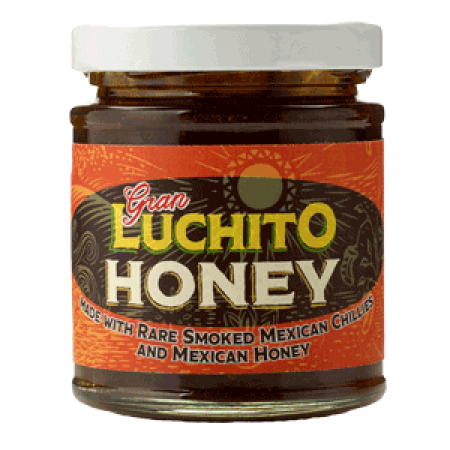 You might have gathered I’m something of a chilli-head and so I was rather intrigued and quite excited to discover this pot of Gran Luchito Honey flavoured with smoked Mexican chillies in my latest recipe box from Kitchen Nomad. I only had a small pot and all of it was used in a Chilli Honey Crumble, which was absolutely delicious, but I do wish I had some more as I think it would be wonderful simply spread on hot buttered toast. Fellow blogger Kelly Anderson mentioned recently on Instagram that she likes hers “drizzled over chocolate croissants” and I can imagine that working too. It has a heavenly smoky sweet flavour, spiked with occasional bursts of intense chilli heat. I must get my hands on more of this stuff. And soon. I received a pot of this sun dried tomato paste from Olive Branch in my goody bag at Food Bloggers Connect back in the summer. Featuring sun dried tomatoes mixed with garlic, fresh basil and oregano, the paste packs a tasty punch and is bursting with flavour. We’ve been enjoying it smeared on bruschetta and it’s the perfect way to create a simple pasta bake, with the addition of black olives and mozzarella, for a quick and easy supper. While I’ve yet to buy a single Christmas present (and I plan to spend as little as I can this year by making as many gifts as possible), I think these neat little cookbooks would make fun stocking fillers for the fellow foodie in your life. 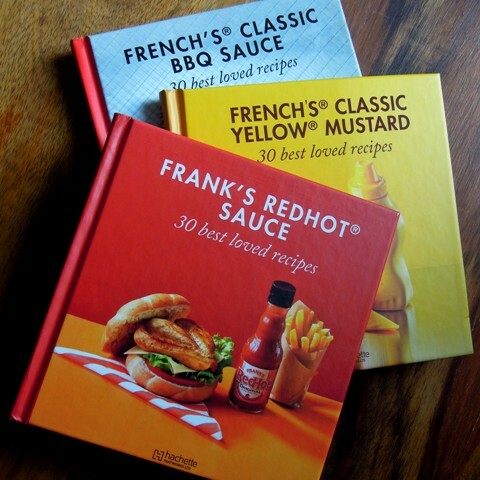 I haven’t tried the BBQ sauce, but I am rather partial to Frank’s RedHot sauce and, although French’s Classic Yellow Mustard isn’t a patch on our own very fine English mustard, it is a must when you’re enjoying American-style hot dogs. I think I might be addicted to this ancho chilli from the Cool Chile Co. It is a fairly mild chilli but one that gives a full-flavoured, smoky and fruity intensity to your Mexican dishes. Apparently it’s an indispensable ingredient in Mole Poblano (a rich chilli, nut and cocoa sauce), although I’ve been using it in black bean soup and rajas tacos, two more recipes from this month’s Mexican Kitchen Nomad box. But to be honest I think I could eat practically any dish if it comes with a handful of toasted ancho chillies sprinkled on top! Disclosure: I was sent Mr Trotter’s Great British Pork Crackling and French’s & Frank’s Red Hot recipe books for review purposes. No money exchanged hands and all opinions expressed are my own. I bought the husband a bag of Mr Trotters and ended up eating them myself – oops, but they were very nice! We are addicted to Franks Red Hot sauce & I bet I would love those Ancho chillies..my mouth is watering! Mr Trotter’s are good, aren’t they? I hear they might have some new products coming out soon – can’t wait to find out more! Can you tell me if the Mr Trotters are gluten-free? My boyfriend loves pork crackling but most varieties contain gluten and he’s a coeliac…. I’m not sure Beth – will check for you! Hi Beth – I’ve checked with Mr Trotter’s and unfortunately the crisps and scratchings do have wheat protein I’m afraid. Sorry! Jalepeno pork scratching – that sounds too good to be true, I must find some of those! Hope you’re able to get hold of some Anna – they really are very good.